I had the opportunity to meet and bake alongside renowned Pastry Chef Mindy Segal whose many impressive credentials include a 2012 James Beard Award for Outstanding Pastry Chef, Share Our Strength's 2009 Chef of the Year for her dedication to Taste of the Nation, and 2005 StarChefs.com Rising Star, to list but a few. Passionate, creative, and dedicated to her craft, for the past twenty years Pastry Chef Mindy Segal has pushed the dessert envelope since graduating from the culinary program at Chicago's Kendall College. Along the way to culinary excellence, she worked at Ambria working under Chef Judy Contino, at Spago, Gordon, and Charlie Trotter's, and with Chef Michael Kornick to launch mk. In 2005, Chef Mindy Segal opened her own restaurant, Hot Chocolate, where her pastry is front and center. Pastry Chef Mindy Segal graciously shares her recipes from her Celebrating Strawberries class during The New York Culinary Experience 2013 hosted by New York magazine and The International Culinary Center. 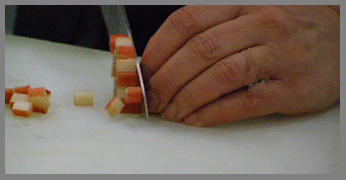 Method: De-stem the strawberries and slice in half. 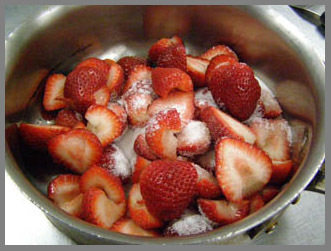 Sprinkle with sugar and let strawberries macerate or marinate for approximately 1 hour or up to 2 days in the refrigerator. Cook strawberry mixture with a pinch of lemon juice over medium heat until strawberries and juices begin to boil. 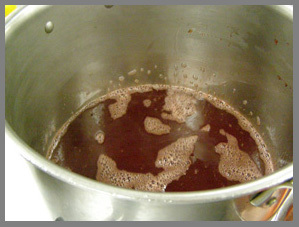 Turn down to a simmer and cook until liquid has reduced about 80%. Place in a container and refrigerate. 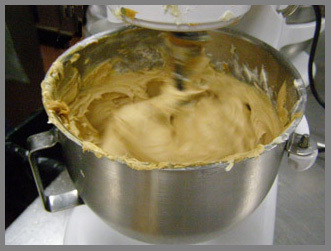 Method: In a mixer with paddle attachment, cream butter and sugars, until light and fluffy, add peanut butter and mix to combine. Scrape sides of bowl, bringing ingredients together. Add egg, milk, and vanilla extract. Mix to combine. Add all dry ingredients and mix to combine. Scrape sides of bowl, bringing ingredients together. Refrigerate until solidified. Remove peanut butter dough from the refrigerator. Divide into 2 pieces. Knead each piece to make homogenous. Dust a piece of parchment paper with flour and roll each piece of dough into a rectangle approximately 12-inches x 20-inches and one-eighth inch thick. Refrigerate again re-solidify. 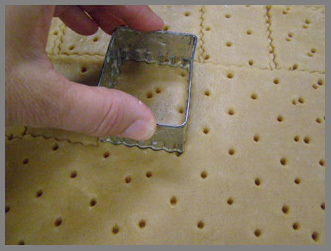 Cut cookie dough in desired shape; make sure to cut equal shapes for top and bottom of sandwich. 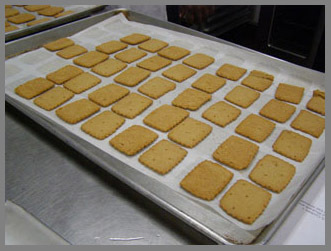 Place on baking sheet lined with parchment paper three-quarters of an inch apart. Bake scraps of dough and grind into crumbs for decorating cookie. Bake for approximately 15-20 minutes, rotating sheet pan in oven half way through to bake evenly. Let cool completely. 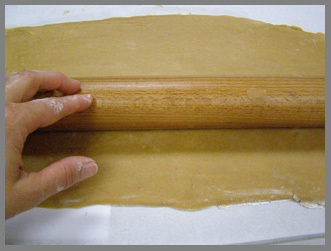 Method: In a mixer bowl with paddle attachment, cream butter and peanut butter until smooth. Scrape bowl to bring together. Add powdered sugar and cream until light and aerated. Season with salt, vanilla extract, and whiskey. Melt 1 pound of bittersweet chocolate and set aside. Turn half of the cookies over and schmear peanut butter frosting on the cookie. Place a small dollop of the preserve on top. Place another lighter schmear on the other half of the cookie to seal cookie together and sandwich together. Refrigerate to set, approximately 15-20 minutes. To decorate the cookie, dip half of the cookie in melted chocolate. Then dip in peanut butter cookie crumbs. Let cookie set. Cookies are best served cold or at slightly room temperature. Method: Clean and hull strawberries and marinate in sparkling rosé for 24 hours. In a heavy-duty saucepot combine strawberries, sparkling rosé, sugar, orange juice, and honey. Bring mixture to a boil, turn down to a simmer, and cook until strawberries have been broken down, about 20 minutes. Let the liquid settle for a few minutes. Strain the liquid through a fine mesh strainer lined with cheesecloth and let liquid slowly drain. 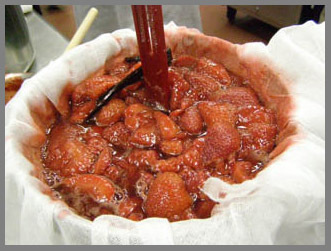 (Reserve strawberry pulp for cooking down for preserves). Taste consommé and adjust seasoning. If it is too sweet, squeeze a quarter of a lemon in the mixture. Method: Preheat the oven to 325°F. Puree the buffalo milk ricotta until smooth. Set aside. 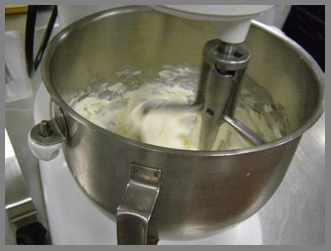 In a mixer bowl with paddle attachment, cream the cream cheese until smooth, scraping down the sides of the bowl to keep smooth. Add sugar and cream. Scrape sides of bowl. Add eggs one at a time. Do not over mix. Add ricotta, vanilla bean, vanilla extract, cream, and kosher salt. Mix to combine. Strain through a fine mesh strainer. Spray a 2-ounce ramekin of ring mold with vegetable oil spray. (If using a ring mold, line bottom and sides with foil.) Fill molds three-quarters of the way up the sides with the cheesecake mixture. 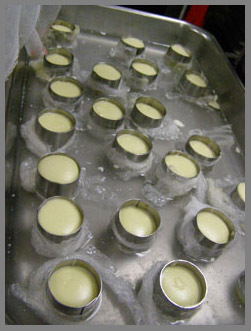 Place the ramekins or molds in a water bath and slowly bake for approximately 15-20 minutes or until cheesecakes are just set. Remove from oven and let cool completely. Method: Preheat the oven to 350°F. Place all ingredients in a food processor and pulse until mixture comes together and resembles fine crumbs. Toast in the oven, stirring every couple of minutes until crumble resembles coarse sand, approximately 1-15 minutes. Let cool. Chop fine when cooled and reserve for plating. Method: Clean rhubarb of all dirt by rinsing in cold water. Remove all leaves and green parts. 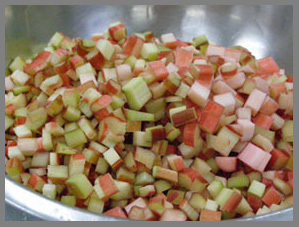 Cut rhubarb into small cubes approximately one-half inch high. Bring consommé to a boil and then reduce the heat to a simmer. Add the rhubarb and cook until tender. Do not bring to a boil. Place the consommé with rhubarb in a shallow soup bowl and serve with a cheesecake and a sprinkle of oat streusel for texture. 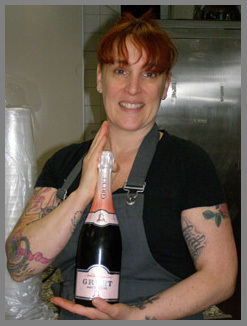 Read about Pastry Chef Mindy Segal's class, Celebrating Strawberries, in the Gastronomy section and interviews and recipes from the other classes in the Gastronomy and Chefs' Recipes section. © June 2013. Luxury Experience. www.LuxuryExperience.com. All rights reserved.